Miller, Daniel P. “SIREN 2015 Lecture Review: The Unthinkable Organization.” Social Epistemology Review and Reply Collective 4, no. 6 (2015): 35-39. Macfarlane, Allison. “Nuclear Impacts: Uranium, Waste, and Nuclearity.” Social Epistemology Review and Reply Collective 1, no. 5 (2012): 1-2. The fourth lecture, “Fukushima Accident Recovery, Decommissioning and Decontamination”, in the Seminar on Interdisciplinary Research and Education in Nuclear Emergency Response (SIREN) was presented by Dr. Douglas M. Chapin on 28 April 2015 at the Virginia Tech Research Center in Arlington, Virginia. Dr. Sonja Schmid of Virginia Tech hosted the talk as part of a National Science Foundation (NSF) CAREER grant that provides a venue for nuclear power experts to share their expertise and experience related to nuclear system accidents. Dr. Chapin has been working in the nuclear field for over fifty years. He began his professional career, in the 1960s, as an engineer with Naval Reactors in Admiral Hyman Rickover’s nuclear Navy. After his Naval service he joined the engineering consulting firm MPR Associates, Inc. and, over the past five decades, has been extensively involved with government and industry nuclear projects and initiatives at the highest levels. He received his PhD in Nuclear Studies in Chemical Engineering from Princeton University. In the SIREN keynote address (Macfarlane 2015), former U.S. Nuclear Regulatory Commission (NRC) Chairman Allison Macfarlane discussed the world’s responses to the Fukushima Daiichi nuclear disaster and to an event “generally thought of as unthinkable: the complete failure of systems that are designed to prevent failures of nuclear systems” (Miller 2015a, 32). The theoretical failure of the base nuclear system was planned for by the nuclear plant builders, but was perceived of as an unthinkable occurrence due to the construction of what were considered to be fail-safe backup systems. Nuclear engineers did not develop plans to mitigate the total destruction of the backup systems because, after all, at what point do you stop backing up the backups? In this context, Macfarlane described a mode of the nuclear system, its complete failure or a “failed mode system” (Miller 2015b, 21), which, unsurprisingly, system designers had not previously recognized nor planned for. Dr. Chapin describes another unthinkable aspect of the nuclear system life cycle that is coupled with the failed mode; the decommissioning and decontamination (D&D) of a failed nuclear system. Dr. Chapin began his lecture by contrasting the tremendous differences between the D&D efforts required for a normal end-of-life nuclear system and that needed for a failed mode system. He points out that decommissioning and decontaminating a nuclear reactor, as part of its normal life cycle, can be relatively straightforward with generally known, albeit substantial, effort and costs. Effective decommissioning is facilitated if the “requirements for decommissioning [are] considered at the design stage for new reactor installation or as soon as possible for existing installations” (IAEA 1999, 10). This upstream preparation can be critical to ensure comprehensive plant documentation is maintained and available and the architecture of the plant is planned with eventual decommissioning in mind; for example, ensuring that the plant design limits workers’ radiation doses during decommissioning and is built to accommodate decommissioning equipment (IAEA 1999). Dr. Chapin then makes it clear that even if a nuclear facility is inherently designed for decommissioning and plans are in place, a catastrophic accident, such as that at Fukushima Daiichi, “completely alters and affects D&D” (2015). With multiple reactor cores melted, structures destroyed, and radiation contamination widespread, execution of D&D became something fundamentally different. Timelines and cost estimates are essentially unknown due to the magnitude, difficulty and hazardousness of the tasks to include the need to invent, on-the-fly, new D&D technologies. Dr. Chapin conservatively describes the Fukushima Daiichi D&D as requiring at least several decades and many tens of billions of dollars. D&D for Fukushima Daiichi can be considered, for practical purposes, a “permanent project” since it will span multiple generations of nuclear professionals, shifts of governmental oversight, and changes in the Japanese political domain. Chapin goes on to describe what this exceedingly complex D&D system has accomplished, how it is organized, who is involved, and its plans for long term future actions. More than four years after the accident, Dr. Chapin described the situation at Fukushima Daiichi as stable and the initial response and recovery actions complete. Approximately 7,000 workers are active on the site each day in order to maintain safety, stability, and to plan next activities. The complex organizing and planning activity is ever evolving and includes Japanese national and local governments and the Tokyo Electric Power Company (TEPCO) with funding from both. Government’s role includes creation of directives and policies by the Prime Minister’s office and the Ministry of Economy, Trade and Industry (METI) with the Nuclear Regulatory Agency (NRA) providing technical and regulatory oversight. Also included are Japanese and international research and development companies, and universities. All ten Japanese utility companies (not only TEPCO) are involved in addition to many types of nuclear technology suppliers and other advanced technology firms specializing in areas to include robotics, instrumentation, water decontamination and advanced construction techniques. Ultimately, the objective is to have all of these entities working together to enlist required expertise, form R&D alliances, build needed decommissioning and decontamination technologies and develop action plans and schedules. Clearly, this is an extremely daunting task for something requiring, as of yet, unknown technical and management solutions, costing billions of US$, and stretching over much of the century. It does not require a great deal of technical assessment or imagination to realize that these in-place organizations, e.g. METI, NRA, TEPCO et al, do not have the capacity, native expertise, nor resiliency to effectively implement and manage the decommissioning of a failed nuclear plant. Dr. Chapin describes three new organizations that were created specifically for the Fukushima Daiichi decommissioning and decontamination project: the International Research Institute for Nuclear Decommissioning (IRID), the Fukushima Daiichi D&D Engineering Company (FDEC), and the International Expert Group (IEG). The IRID is a Japanese company, established in August 2013, that has a long term focus on advanced D&D research and development through both Japanese and international activities. IRID provides the coordination, management and implementation of cooperative technological development for decommissioning. The FDEC was created by TEPCO, in April 2014, as a subsidiary completely dedicated to D&D at Fukushima Daiichi and as the primary authority for site activities. The IEG is six member group of international experts with experience in nuclear plant decommissioning, accidents and cleanup. There are six members with two from the United States, to include Dr. Chapin, and one person each from the UK, France, Russia and Ukraine. This select group meets several times a year in Japan and provides diverse expert technical advice to the IRID and TEPCO pertaining to the Fukushima Daiichi decommissioning. Chapin emphasized that their advice was just that, advice. 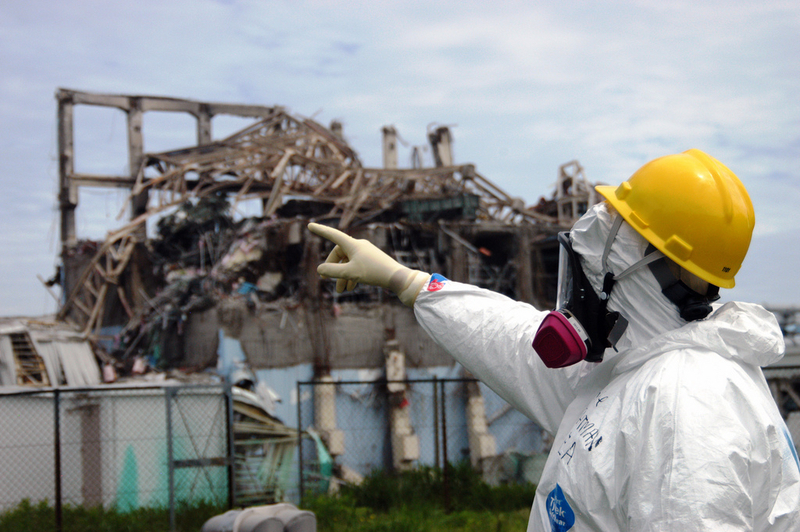 Their recommendations have no force of regulatory policy or law, but their respective unique experiences with nuclear disasters most likely provide the best available advice anywhere in the world. Each of these new organizations is an artifact of the Fukushima Daiichi accident that is necessary to implement decommissioning activities for the failed system. We can see that the disaster shaped each organization’s D&D tasks. The activities that were originally created for predictable execution in the normal, closed world of an end-of-life nuclear power station had to be recreated to adapt to the utterly open and unknown world of the nuclear disaster at Fukushima Daiichi. Chapin outlined the long-term, multiphase, D&D program that has been built since the beginning of the disaster and continues to develop. It is heavily composed of activities focused on ensuring the destroyed system continues to remain stable and radiation doses are within acceptable limits. This includes guaranteeing that both spent fuel and fuel debris in the melted reactor cores are continually cooled and shielded with water. Ironically, one of the most public concerns is the flow of ground water, approximately 300 tons per day (TEPCO 2015), which is contaminated as it streams through the site toward the ocean. TEPCO has developed several types of systems to block and contain the water and to either decontaminate it or store it. Even when TEPCO shows that the water is apparently decontaminated, local residents and fishermen have yet to be convinced that is safe to be discharged into the ocean. An ever growing field of hundreds of water tanks surrounds the Daiichi site with no known end in sight. Also, as the program progresses, the decommissioning organization’s R&D teams will need to develop new and innovative technologies to safely remove and store fuel debris that is in an unknown condition inside the destroyed reactors. It could conceivably be decades before this is possible. Chapin said that the D&D program has been following a strategic and technical roadmap over the past two years that lays out plans, objectives and tasks that were informed by the recovery roadmaps of other nuclear accidents. TEPCO will publish an updated roadmap later this year, which makes evident the continual creation of decommissioning technical solutions, and political and public influences. Such evolving sequences of activities will continue to engage with life or death situations for decades to come and make it apparent that the Fukushima Daiichi decommissioning and decontamination is worlds away from a conventional hazardous material cleanup. Dr. Chapin, as an expert participant, provides a real time look at how Japan and the world’s nuclear community is progressively creating and adapting a technical and organizational structure to decommission and decontaminate the Fukushima Daiichi failed mode nuclear system. The unthinkable disaster has necessitated the construction of technologies and management organizations that, prior to the disaster, were unthinkable in themselves. This encompasses an international, industrial scale response, requiring enormous investment, innovative technological development and new management systems. Before the accident, even when considering the disaster at Chernobyl, which did not have significant global implications (Schmid 2015), no practically implementable D&D technologies or organizational systems for a failed nuclear plant existed. There were no organizational and communications constructs, no predetermined delineation of D&D roles and responsibilities and no mechanics nor strategies to engage with issues of national sovereignty, proprietary technologies, funding, public engagement, and global risks. All of these and others are now being grappled with and will be for a long time to come. This situation has been recognized by the IAEA with their recent initiation of the three year International Project on Decommissioning and Remediation of Damaged Nuclear Facilities (DAROD). Its aim is to capture and share what is learned during the decommissioning of damaged nuclear plants (IAEA 2015). Dr. Chapin emphasized that, “… a huge amount of unique and difficult site work is yet to be done … [and] … I generally agree that the Fukushima Decommissioning Project may well take 3-4 more decades” (2015). The IAEA and the world nuclear community, unfortunately, have many more than three years to learn and share their lessons, but they have to hurry because the next unthinkable event may not be decades away. Chapin, Douglas. “Fukushima Accident Recovery, Decommissioning and Decontamination.” Seminar on Interdisciplinary Research and Education in Nuclear Emergency Response (SIREN): Virginia Tech (2015): Presentation. IAEA (International Atomic Energy Agency). “DAROD Project: International Project on Decommissioning and Remediation of Damaged Nuclear Facilities”. Vienna: IAEA, 2015. IAEA (International Atomic Energy Agency). Decommissioning of Nuclear Power Plants and Research Reactors. Vienna: IAEA, 1999. Macfarlane, Allison. “International Response to Nuclear Emergencies: The Case of Fukushima.” Seminar on Interdisciplinary Research and Education in Nuclear Emergency Response (SIREN): Virginia Tech, (2015): Presentation. Miller, Daniel P. “SIREN 2015 Keynote Address Review: The Nuclearity of Disaster.” Social Epistemology Review and Reply Collective 4, no. 3 (2015a): 31-35. Miller, Daniel P. “SIREN 2015 Lecture Review: ‘Leading and Communicating when Technology Fails’.” Social Epistemology Review and Reply Collective 4, no. 5 (2015b): 20-24. Schmid, Sonja D. Producing Power: The Pre-Chernobyl History of the Soviet Nuclear Industry. Cambridge, MA: The MIT Press, 2015. TEPCO (Tokyo Electric Power Company). “Summary of Decommissioning and Contaminated Water Management.” Tokyo: TEPCO, April 30, 2015.